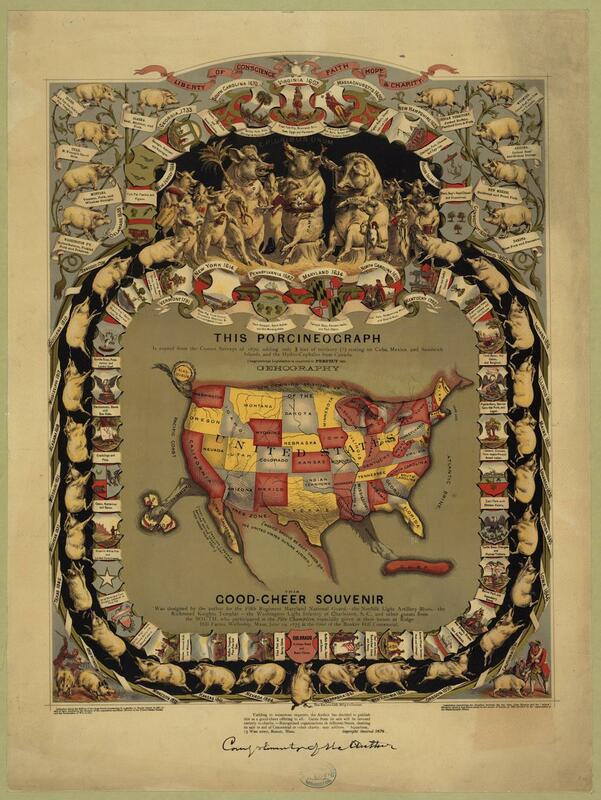 Blogger John Ptak recently included this delightful “Porcineograph” in a roundup of strange maps of the United States. The map was commissioned in 1875 by a former sewing-machine magnate, William Emerson Baker. In the mid-1870s, Baker’s activist heart turned to the nascent Pure Food Movement, which lobbied for stricter regulations on food producers. (The movement was unsuccessful before Upton Sinclair’s The Jungle was published in 1906.) Baker became obsessed with hygienic farming. In 1875, he held a big party, with 2,500 attendees, to launch his “Sanitary Piggery,” a new kind of hog farm featuring ultra-clean housing and controlled diets. Because Baker was a man of many causes, the get-together also celebrated the centennial of the battle at Bunker Hill, and, through the invitation of Southern guests, advocated reconciliation of North and South. This map, which focused on the porcine aspect of the party, was a souvenir for his guests. Its elaborate detailing included small illustrations of disputes over pigs that changed American legal history, tucked into the bottom corners. The map’s border celebrates pork dishes, or menus featuring pork dishes, that were emblematic to each state and territory. Interspersed with cavorting pigs are banners describing each menu. Click on the image below to reach a zoomable version, or visit the map’s page on the Library of Congress’ website. Porcineograph. Printed by Forbes Lith. Mfg. Co., Boston, ca. 1875. Library of Congress, Popular Graphic Arts.